Today is undoubtedly the only somewhat-global, partly-legal, semi-holiday to emerge from Northern California. As California moves closer to a historic vote on the legalization of marijuana in November, a day which was once solely the subject of stoner lore now marks an interesting opportunity to consider an issue at the heart of many of the debates on cities — what can be done, and where. In our discussions on illegality and informality, we often focus on places, especially on the "illegal" occupation of land, and particularly for housing. This makes sense — land is the center of everything these days, and the right to lay your head should be at the heart of how we think about space. But citizenship must be based not just on where you live but where you work and where you play, for they have not yet invented a way of making a living or having conscious fun that is thoroughly “aspatial.” Moreover, the right to neither sleep nor work these days is particularly precious, and forces us to think of legality not solely in terms of occupation and ownership but in terms of activities. Some activities — i.e., buying and selling of most goods — are themselves legal, but not legal on that place or in that time or by that (permitless or licenseless or "illegal") person. There are a few non-violent activities which are technically illegal in all places and at all times, but we all know full well that in practice such is not the case. I would argue that in all but a few cases, non-violent illegality can only truly be understood as a nexus of activity, people, place and time — what is done, by whom, where and when. In California, we now have a massive debate in local cities and towns as to how often and where to allow pot clubs that are now semi-legal under Proposition 215 (they are still illegal at the federal level, creating a state of legal limbo that neither side seems eager to test). States and localities throughout the nation are looking to "sin taxes" — taxes on alcohol, gambling, marijuana, cigarettes — to fill the massive fiscal holes left by the Great Recession. Highly restrictive laws on cabaret licenses — which regulate live music and dancing (yes, just like in Footloose) — are also under review by many cities. I t is somewhat pitiful that we in America need the excuse of a massive economic crisis to reconsider the legalities of celebration, to finally revisit laws and regulations which are remnants of our mixture of Puritanism, Prohibition and the War on Drugs. But I hope that this fervor for legalization goes beyond a new source of taxes, and enables us to consider the insanity of how we regulate this interaction of people and places and activities in public spaces, and what constitutes public and semi-public spaces. The fact that my ability to walk down a sidewalk with a beer in my hand is far more regulated and much more illegal than Wall Street's ability to sell me a $500,000 mortgage that I can't afford and which will cost me my home and cost so many of us our livelihood is ridiculous. The founding gurus of urban space were so obsessed with cleanliness and order and the "right" people that they left us with a million rules about who can do what where without dealing with the structural absurdities that leave some many spaces dead and truly alive spaces threatened with erasure (after all, they are illegal!). We need a regulatory two-step: a loosening of the binds which regulate the ability of human beings to congregate, have fun, mingle, sell things of their own making (especially food), walk in the street, dance, protest, run into each other, use empty storefronts for art galleries, start a business without paying (too much) rent, and occasionally do something stupid or rude or embarrassing in public; and a tightening of the rules which allow men to play high-risk, high-profit games with urban capital in a way which destroys lives and cities. 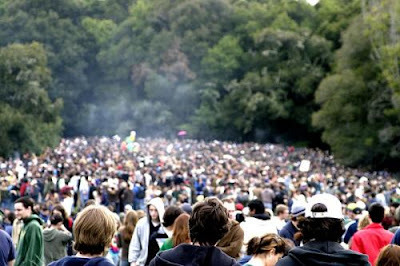 Credits: Photo of 420 days at UCSC from sfgate. Video of Gogol Bordello from YouTube. Remaining photos by Alex Schafran. Ok I agree with everything here except for this idea that somehow only the BANK is to be blamed for lending to someone who KNOWS they can't pay it back. I'm sorry but in most countries without a huge credit market, one doesn't buy what they can not afford. Shouldn't that be common sense? Art for Commerce or Community?